A valiant innings of 79, studded with glorious strokes, from VVS Laxman took Indian cricket to the verge of a potentially epoch making Saturday. Australia, thrown down the gauntlet of 413 to win by India, had lost both openers to Irfan Pathan, yet were 348 runs in arrears at stumps on the third day here at the WACA. VVS Laxman seems to have made it a habit of coming good in tense situations. The stylish Indian batsman says he actually enjoys playing rescuer time and again as batting under pressure brings out the best in him. Australia will have to defy history to chase down India’s imposing target of 413 to secure a world record 17th consecutive Test win. Young medium pacer Praveen Kumar claimed eight wickets, the fifth-best haul in the history of Ranji Trophy finals, to help Uttar Pradesh take a 52-run lead before Delhi fought back on the third day of the five-day summit clash here today. Bobby Fischer, the USA’s only world chess champion who was once dubbed the “Mozart of chess”, died in Iceland yesterday at the age of 64. A spokesman for Fischer, who could have faced prison in the USA for violating sanctions against former Yugoslavia by playing a chess match there, confirmed the death. Former world number ones Andy Roddick and Amelie Mauresmo were dumped from the Australian Open tonight, beaten by unheralded journeymen. Mauresmo and her fragile temperament succumbed to the tenacity of local girl Casey Dellacqua 3-6, 6-6, 6-4, while Roddick went down to little-known but gifted German Philipp Kohlschreiber 6-4, 3-6, 7-6, 6-7, 8-6. Gulmarg is gearing up to host the fifth National Winter Games to be held from February 18 to 22. About 500 sportspersons comprising 18 teams from 11 states, including Jammu and Kashmir, would take part in the games, said Farooq Ahmad Lone, chief executive officer of the Gulmarg Development Authority. Acting chairman of the 2010 Commonwealth Games Federation (CGF) Coordination Commission Bruce Robertson has expressed concern at the shortage of rooms and the high tariff rates for rooms in Delhi hotels. Punjab’s junior badminton team recorded a historic victory as they clinched the under-14 title in the 53rd National School Games after a gap of 15 years. Jeev Milkha Singh, Jyoti Randhawa and Shiv Kapur missed the cut in the Abu Dhabi Golf Championship here today. New Delhi Heroes rallied to defeat Tarun Sangha 4-2 to enter the final of the Delhi Soccer Association Senior Division League Championship at the Ambedkar Stadium here today. Top Indian shuttler Anup Sridhar squandered a one-game advantage and lost to Korean Lee Hyun Il in the Malaysia Open Super Series men’s singles second round here. New Delhi: Drag-flicker Diwakar Ram and Sarwanjeet Singh pumped in two goals each as India continued their victory spree thrashing New Zealand 6-1 in the eight-nation Junior International Hockey Tournament in Kuala Lumpur today. India recovered from a precarious 125 for five to post 294 in the second innings, thanks to Pathan, Mahendra Singh Dhoni and RP Singh chipping in with invaluable supporting roles. Persisting extra bounce in the pitch should prove useful to the Indian bowlers. There is a considerable difference between the highest winning fourth innings total at the WACA — the one against India in 1977, when Bobby Simpson’s second string Australia compiled 342 for eight — and the present target, which has been reached only once in 131 years of Test cricket. But for the Australians presently experiencing a halcyon period in their history, the outcome would have been a foregone conclusion. It was mostly overcast and windy; and therefore, ideal for swing bowling. The breeze was such that Stuart Clark, a Glenn McGrath clone, got assistance for his inswingers, while the leader of the attack, Brett Lee, obtained help for his away going ball. It served the purpose, for this duo and Mitchell Johnson virtually decimated the much vaunted Indian middle order. 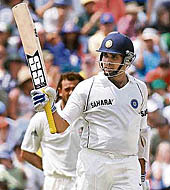 Having reached a well-made 43, Virender Sehwag was bowled through the gate by Clark. Meanwhile, Lee was already on overdrive; and in a superb spell either side of drinks, took out the two diamonds — Rahul Dravid and Sachin Tendulkar — in the Indian batting chain. The former he defeated with an outswinger, the latter with just an opposite delivery. Johnson rested Clark at the southern, Lillee-Marsh end. Night-watchman Pathan, growing in confidence, steered him for four and then magnificently off-drove to the boundary to secure 10 off an over. But the left-arm slinger hit back by inducing Sourav Ganguly into an edge to first slip before he had opened his account. The tourists, thus, lost four precious wickets in only 22 overs, but managed to maintain a run rate of over 4.80 an over. Pathan, who’s made a sterling comeback, promised much, but disappointed by chasing a wide ball from Clark in the very first over after the break to make his exit. It was, now, make or break for India, with the last pair of recognised batsmen at the crease, one of whom — Dhoni — yet to convince in Australian conditions. But the one-day dazzler negotiated the quicker bowlers with assurance, converting himself into a stroke-less wonder. Rather than risk Johnson or Shaun Tait, both of whom had proved to be expensive, and because of the shambolic over rate, Ponting turned to Michael Clarke’s left-arm spin. Dhoni gleefully jumped out of his crease to smack him to long-on for six. The reveller from Ranchi also despatched Andrew Symonds’ medium pace over long-off. But once the latter switched to off-spin, he was beaten by the bounce to top-edge a sweep to the leg slip area, where a flying Adam Gilchrist gloved an acrobatic catch. Symonds struck again in the same over, deceiving Anil Kumble with a straighter delivery, which meant India went into tea at an uneasy 245 for eight, which, though, included a six by RP Singh at the expense of the long-haired off-spinner. Fall of wickets: 1-45, 2-79, 3-82, 4-116, 5-125, 6-160, 7-235, 8-235, 9-286. Bowling: Lee 20.4-4-54-3, Johnson 10-0-58-1, Clark 19-4-61-4, Tait 8-0-33-0, Clarke 13-2-38-0, Symonds 10-2-36-2. Fall of wickets: 1-21, 2-43. 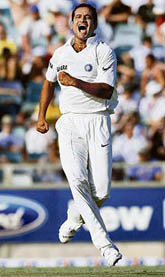 Bowling: RP Singh 5-1-24-0, Pathan 6-1-22-2, Ishant 3-0-10-0, Anil Kumble 1-0-6-0. Laxman tipped India to win, saying that Australia, who ended the day at 65 for 2, would be under tremendous pressure to get another 348 runs in the fourth innings. “They will be under a lot of pressure. The way our bowlers have bowled, getting the target wouldn’t be easy,” he said. “It was important for us to get more than 400 runs, that’s why the partnership with RP Singh was important,” he emphasised. Laxman put on 51 runs with number 10 batsman RP Singh and revealed the planning which went behind the critical stand. “I made a conscious effort to play Brett Lee out. RP was feeling more comfortable playing out Shaun Tait and Stuart Clark,” he elaborated. He also lavished praise on Mahendra Singh Dhoni. “Dhoni played a very mature knock. In the last about eight months, like he did at Lord’s, he has shown that he can adapt himself to situations,” he said. “RP also showed lot of determination and guts that that he could bat against quicks in Perth,” he added. Except for the West Indies, who hold the record for the highest run chase in the fourth innings, no Test team has ever achieved the feat of scoring so many runs. Australia’s most successful run chase in the fourth innings is 404 for 3 recorded against England at Leeds in 1948 and with the hosts having already lost two wickets the target looks even more daunting. Of the top five successful chases in the fourth innings, the Australians find themselves at three places in the list, 369 for 6 versus Pakistan at Hobart in 1999-2000 and 362 for 7 against the West Indies at Georgetown in 1976-77 being the two other occasions. The West Indies hold the record of 418 runs, achieved against Australia at St John’s in 2002-03, while India are the second in the list with their 406-4 against the Caribbeans at Port-of-Spain in 1975-76. The WACA, where the pitch is regarded as the fastest in the world, has been a happy hunting ground for the hosts. But even here their most successful fourth innings achievement is 342-8 against India in 1977-78. Praveen utilised the second new ball to telling effect to send Delhi crashing from 232 for four to 290 all out, with overall figures of 8-68, before UP plunged to 154 for six in the second innings on an action-packed day. The 21-year-old Meerut-born Praveen’s innings return was the fifth-best in the final of the national championship. Only fellow-UP left arm spinner Rajinder Singh Hans (9-152 v Delhi, 1977-78), Mumbai left-arm spinner Padmakar Shivalkar (8-16 against Tamil Nadu, 1972-73), Mumbai off spinner Manohar Hardikar (8-39 against Bengal, 1955-56) and Delhi left-arm spinner Maninder Singh (8-54 against Haryana, 1985-86) have returned figures better than those of Praveen. His heroics came after overnight Delhi batsmen Akash Chopra (102, 17 fours) and Rajat Bhatia (139 not out, 18 fours, four sixes) added 36 runs to their overnight 196 for four. He was on a hat-trick after sending back Chopra and wicketkeeper Puneet Bisht off successive balls in the very first over with the second new ball before adding the scalps of Sumit Narwal, Pradeep Sangwan and last man Amit Bhandari in a devastating spell. Fall of wickets: 1-1, 2-15, 3-15, 4-36, 5-232, 6-232, 7-244, 8-247, 9-270. Bowling: Praveen Kumar 32.1-8-68-8, Sudeep Tyagi 24- 5-63-2, Bhuvanesh Kumar 15-5-54-0, Piyush Chawla 13-2-57-0, Praveen Gupta 10-2-29-0, Ravikant Shukla 2-0-7-0, Rohit Srivastava 2-0-5-0. Fall of wickets: 1-1, 2-63, 3-123, 4-126, 5-130, 6-130. Bowling: Pradeep Sangwan 15-3-41-2, Sumit Narwal 12- 5-48-1, Amit Bhandari 11-2-28-1, Rajat Bhatia 8-3-14-1, Chetanya Nanda 7-1-23-0. Bobby Fischer, the USA’s only world chess champion who was once dubbed the “Mozart of chess”, died in Iceland yesterday at the age of 64. A spokesman for Fischer, who could have faced prison in the USA for violating sanctions against former Yugoslavia by playing a chess match there, confirmed the death. Iceland national radio reported that he had succumbed to an unspecified illness. Fischer, a former child prodigy who once said he liked to watch his opponents squirm and who had become an Icelandic citizen, became world champion by beating the Soviet Union’s Boris Spassky under the glare of Cold War publicity in Reykjavik in 1972. The brilliant but eccentric American abandoned his title without moving a pawn by failing to meet a deadline to defend his crown in Manila in 1975. World chess authorities reluctantly awarded it to challenger Anatoly Karpov of the erstwhile Soviet Union, who was to hold it for the next decade. He made headlines and fell foul of US authorities when he came out of seclusion to play his old rival Spassky in Yugoslavia in 1992, at a time when the country was the target of sanctions during Belgrade’s war with breakaway republics. He vanished after the match, for which he won $3 million, and resurfaced only after the September 11, 2001, attacks. In an interview with a Philippine radio station, Fischer praised the strikes and said he wanted to see America “wiped out”. Fischer, who also stirred controversy with anti-Semitic remarks, was granted Icelandic citizenship in March 2005 after eight months in detention in Japan fighting a US deportation order. It was not an idle claim. Arguably the greatest natural chess genius the world has seen, he was called “the Mozart of chess” when he began winning at the age of six. He was the youngest international grandmaster ever at 15. Former world number ones Andy Roddick and Amelie Mauresmo were dumped from the Australian Open tonight, beaten by unheralded journeymen. Mauresmo and her fragile temperament succumbed to the tenacity of local girl Casey Dellacqua 3-6, 6-6, 6-4, while Roddick went down to little-known but gifted German Philipp Kohlschreiber 6-4, 3-6, 7-6, 6-7, 8-6. Earlier, the day session had proved fertile for the seeds, including Justine Henin, Serena Williams and Rafael Nadal. Top seed Henin advanced by beating tricky Italian Francesca Schiavone 7-5, 6-4. Henin meets Hsieh Su-wei for a place in the quarters after the Taiwanese player ousted France’s Aravane Rezai. Serena eased through with a routine 6-3, 6-4 win over Victoria Azarenka of Belarus. Jelena Jankovic beat Virginie Razzano 6-2, 4-6, 6-1 and Maria Sharapova swatted aside Elena Vesnina 6-3, 6-0. Nadal shrugged off a slow start to overwhelm Frenchman Gilles Simon 7-5, 6-2, 6-3. Leander Paes and Agnes Szavay rallied to beat the Czech pair of David Skoch and Renata Voracova to advance to the mixed doubles second round today. The Indo-Hungarian pair won 2-6, 6-2, 10-6. Chief Minister Ghulam Nabi Azad, who is personally monitoring arrangements for the event, said the state would stake its claim for holding the Commonwealth Winter Games at Gulmarg in 2010. The games torch would be taken from Delhi and travel through Auli in Uttar Pradesh and Srinagar before reaching Gulmarg. The events to be held include slalom, giant slalom and snow board in alpine skiing, free style (men and women) in cross country, figure skating and speed skating (men and women) and ice hockey for men in the skating rink category. He said the Commonwealth Games Organising Committee, headed by Suresh Kalmadi and the Delhi Government, would have to devise some dynamic methods to provide accommodation at affordable rates to visitors for the Games. Kalmadi explained the state government’s plans to create more hotel rooms, as well as allowing residential colonies to make rooms available for paying guest accommodation. Robertson said considerable progress had been made since the last meeting of the commission in May 2007. Kalmadi announced the broadcasting agreement for the Games reached between Network 10 Australia and Television New Zealand. Punjab shuttlers beat Maharashtra 2-0 in the final at the Tau Devi Lal Sports Complex, Sector 3, here today. Karnataka secured the third position. Rupinder beat Varun 13-21, 21-16, 22-20, while Antarpreet and Kawaldeep defeated Shilok and Sudhanshu 21-8, 21-13. It was definitely not Maharashtra’s day as their girls’ team lost to Andhra Pradesh 0-2 in the under-14 title clash. The bronze was bagged by Karnataka. In the under-19 boys’ final, Andhra Pradesh beat hosts Haryana 2-1. Maharashtra finished third. In the under-19 girls’ section, Gujarat won the gold after beating Kerala 2-1. Karnataka had to be content with the bronze. After a nightmarish opening round of four-over 76, Jeev returned a one-under 71 but his two-day total of 147 was just not enough to ensure weekend action for him. Randhawa carded his second straight round of 75 to total 150 and crash out. Kapur stuttered to a horrendous second round of five-over 77 to aggregate 151 to see his hopes of making the cut going up in smoke. Heroes will meet last year’s runners-up Indian National in the title clash on January 21. World number 26 Sridhar went down 24-22, 14-21, 13-21 to the Korean ranked two places below him at the Putra Stadium in Bukit Jalil. India had beaten South Korea by an identical 6-1 score in their opening tie yesterday.